Core-Admin was designed as a centralized and highly connected solution that provides support for managing multi-servers using a single web administration console. This includes an advanced permission system and monitoring system. There is a “Free Web Edition” that is limited to handle 10 domains. Core-Admin is a complete and extensible solution to manage your servers in a global manner. Now you will be able to connect your end users with your servers’ resources with a few clicks. At the same time, it will provide a global view of all your system while allowing you to manage instantly each server connected. Core-Admin provides you a centralized administration console that will help you to manage, monitor and administrate your servers easily. Designed to support hundred of servers, Core-Admin allows secure access to your set of servers with a single credential in a quick manner, so you easily do manage operations over all of your servers with a few clicks. Core-Admin comes with a complete and extensible set of internal checkers, log watching, file system watching and much more. This will provide you valuable information about the current internal state of all your servers. Core-Admin Web Edition and Core-Admin Free Web Edition provides an specific solution carefully designed to meet the needs of Hosting Providers about handling Mail servers, Web servers, Ftp servers and Dns servers. All these elements makes Core-Admin Web Edition a great choice if you have to provide hosting services or to just manage your sites in a secure manner. Core-Admin provides an integrated solution to track your server logs and any other custom log you want as they progress. This means Core-Admin log watcher consumes it as it grows and checks that content, giving you fresh information just when it happens. Core-Admin uses BEEP (http://www.beepcore.org) to handle all connections created between the server, agents and end users. When WebSocket is available, it is used as transport for the BEEP protocol. Using BEEP enables Core-Admin to have several on going and parallel operations under the same connection. This saves lots of resources at servers and agents. Core-Admin is supported in all major browsers and it is regularly tested to ensure proper function across releases. Currently supported web browsers include: Google Chrome 13.0 or higher, Internet explorer 8 or higher, Mozilla Firefox 2.0 or higher, Opera 8.0 or higher and Safari 5.0 or higher. Core-Admin web-client support is not limited only to the above indicated. There are many other web browsers supported because Core-Admin uses standard technologies that are compatible and well supported by web browsers. Core-Admin comes with a set of ready to use applications to do many common tasks required on a daily basis. 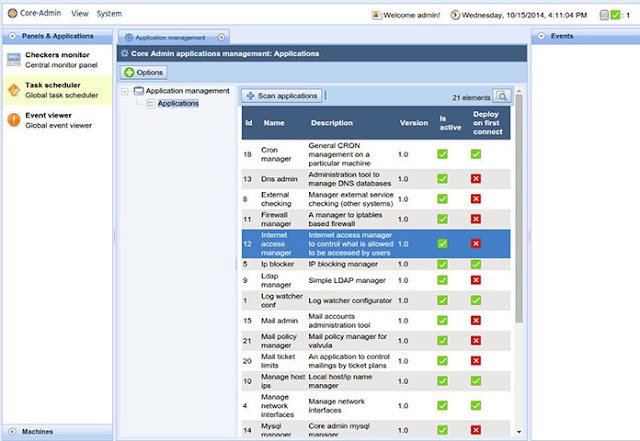 It provides from real time log analysis, to an integreated ip blocking system, easy to use cron management, external checkings, processes and services viewer and many more. Core-Admin includes many security options that will help to improve your servers’ security. Core-Admin includes tools to detect and track many security threats like: ssh logins, changes into crontabs, unauthorized modifications into web files (for example hacked .php), misuse of your mailservers by tracking changing auth options or changing ip addresses, etc. Along with the file system change detection (which looks for suspicious modifications), the log watcher also will help you block many unallowed login sequences and brute force attacks. Core-Admin not only will provide you with lot of useful tools to manage your servers, but to help you improve your system security by tracking the state of the system to the minute. Core-Admin log watcher provides a powerful and an integrated file system watching solution which will help you know to the minute changes produced in the file system at any of your servers. This integrated solution also provides useful features like content expression matching or detailed change reporting. All connections done between Core-Admin agents, servers and clients connected are protected with 2048bits TLS certificates. This ensures all traffic travels in secure manner between elements. This option is included in all Core-Admin editions. Core-Admin provides a powerful and easy to use updating system that will help you apply upgrades and security patches to Core-Admin software on all connected servers with a few clicks. The most important feature of the updating system is that it allows you to update the central panel, agents and all applications connected to it from a single point (the central panel) so you save a lot of time by doing massive updates to all your systems. Core-Admin is designed as a plataform to manage large set of servers. It allows you to develop and easily deploy new applications on top of it.